Werkplaats RUIM does installations and performances in specific locations under the title "PLEK" (a Dutch word for place, spot). The project PLEK concentrates on an area as a starting point for performances and living installations. 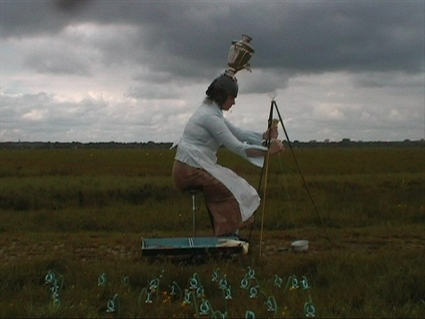 During every performance, starting from the possibilities of the location, a different installation/landscape develops around one or more performers. When the performers step out of their installation, the surroundings have changed. The aim is to add a new story, a new meaning to the site. PLEK was recently carried out in the catacombs of Theater de Kolk in Assen, NL as part of the image-theater festival Summertrip 2005. Performance, light/sound objects, animated films and video performances formed a poetic, absurdist world. and the art of milking!